Roundabout to Relieve Traffic at San Carlos Boulevard in Fort Myers Beach? Traffic entering and leaving Fort Myers Beach has always been something of a headache, especially if there is a special event. Some say it’s so bad, it keeps them off the island altogether, though that has done little to alleviate congestion. Now, there is a proposal on the table from the Florida Department of Transportation that seeks to address the problem: Roundabouts. A lot of them, in fact. The state agency has posited that constructing roundabouts at nearly every intersection from Crescent Street to Summerlin Road is the solution. Although the proposal is still in development – FDOT has said it will present its traffic-calming study to the public in February – some council members have expressed skepticism, as have a number of business owners. Still, most agree something has to be done. Tourists come from all over the world to visit Fort Myers Beach, and even when we’re not in season, bumper-to-bumper traffic can result in an hour-long commute just to get from one end of the mile-long Matanza’s Pass Bridge to the other. This can increase the risk of rear-end accidents and road rage. So how might roundabouts actually help? Roundabouts are large, raised circular islands in the middle of major intersections. All oncoming traffic has to go around this circle until reaching the destination street. These features help to create a calm, steady flow of traffic. Because there are fewer conflict points on a roundabout, there is less of a chance for an auto accident. 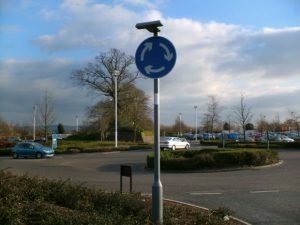 Most of the time, traffic signals aren’t needed at roundabouts, though traffic control signs are usually quite prominent. On top of that, roundabouts are a lot prettier than intersections because you can be enhanced with attractive landscaping, a sculpture or a fountain in the island. There are also traffic circles, which are basically min-roundabouts. These features are designed for smaller intersections and are usually an effective measure to slow traffic moving from a wide street to a smaller, local street. Lowers fuel consumption (more trips made by walking, biking and transit). But will local leaders buy in? We’ll have a better idea after the plans are formally submitted in February. One of the concerns has to do with questions of liability. If someone crashes on a poorly-designed road, those responsible for designing and maintaining it could be liable. However, that generally requires showing that the design failed to meet certain safety and industry standards or that the intersection/ roadway had been a problematic area for crashes, yet wasn’t addressed. Some fear that because Fort Myers Beach attracts a lot of tourists – many of whom may not be familiar with how roundabouts work – it may actually lead to more collisions. But again, this is where prominent signage is important. Meanwhile, Estero Boulevard has been under construction for more than a year, as crews work to install new waterlines. Additionally, work is underway to repave the street and improve sidewalks on both sides from Times Square to Crescent Street. Trolley stops are also being improved as part of the initiative, and areas designated for large buses are being added so that their stops won’t impede traffic. These projects are on schedule to be finished by January 2017.